Antique railroad china can be a fun and challenging area of railroadiana memorabilia to collect. Seemingly similar items can sell for anywhere from $4 to $4,000. Many more items will be closer to $4 than $4,000. However, that is what is exciting about old railroad china. There are hidden gems sitting on thrift store shelves right this second. The educated buyer has a chance to make some great scores for his or her collection. Why Do People Collect Railroad China? The easiest answer to this question would be nostalgia. 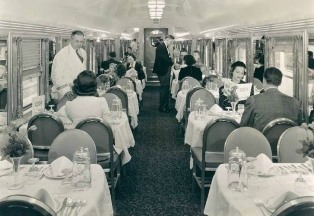 The dining car was the pinnacle of class. China is a direct and physical connection to a bygone era. Collectors have found many different ways to collect antique railroad china. The most common way to collect is by pattern. Other buyers might try to get as many unique service plates as possible. Others still might only collect the unique and rare oddities. The way people collect can definitely affect prices in the market today. Before we get into what makes a piece of RR china rare, let’s first look at what kind of prices you can expect to get. Extremely Common: Sadly, there are some pieces of antique railroad china that are going to be almost impossible to sell as single items for more than $4 or $5 a piece. These items are common to the point that people who want them already have them and everyone else just isn’t interested. Available and Collectible: The large majority of antique railroad china (probably 80%) has a value between $5 and $50 per item. That doesn’t mean that these items are necessarily easy to sell. However, there is a market for them and with some work you can realize that price. Popular and in Demand: These are the kind of items that fairly advanced collectors are looking for. Your value range here is probably $50 to $200. This type of china might only be on the market a few times or year. Rare and Highly Desirable: This is the top 10% of the market. The value range is $200 to $1,000 or more. These items can even get a jaded collector excited. These are valuable for any number of reasons. Read below for more information. Railroad Exclusive China: These are unique patterns that were solely used by a single railroad. A railroad would have to be very large in order to afford the expense of creating its own china line. A couple of examples are the “Mimbreno” pattern from Sante Fe and the “Centenary” pattern from Baltimore & Ohio. Marked China: This is the second most valuable type of railroad china. Railroads would buy stock china and then modify or mark the china so that it was identifiable to the railroad. The mark can be on the front or bottom of the china. The bottom of china can have lots of markings. The most commonly encountered manufacturers are Bauscher, Buffalo China Co, Greenwood Pottery, Hall China Co, Haviland, Lamberton, Maddox, Mayer, Shenango, Sterling, Syracuse, and Union Porcelain Works. There is no premium for one manufacturer over another. The maker should not affect the value. Some antique railroad china items are just rarer than others. For example, you could probably find 1,000 dining plates for every one corn cob holder. Unique and rare means the item should be worth more money. Here is a list of some types of china you might find: ashtray, augratin dish, bakers dish, bouillon cup, bread dish, bread plate, butter pat, celery dish, chocolate pot, coffee cup, corn cob holder, creamer, cup and saucer, demitasse set, dinner plate, dinner plate, divided dinner plate, egg cup, footed bowl, fruit bowl, hot food cover, ice cream bowl, ice cream shell, luncheon plate, milk pitcher, mustard pot, oval bowl, pedestal compote, pedestal egg, platter, radish pot, ramekin, sauce boat, sauce pot, soup tureen, sugar bowl, teapot, turkey platter, vegetable dish, water pitcher. Collectors are looking to be railroad china that is in perfect or near perfect condition. Missing pieces or cracks will likely make a piece uncollectible. Even heavy use (like utensil marks) will lower the value. High end and rare china can still be collectible even with moderate condition issues, but common china with problems with have virtually no value. No antique guide would be complete without briefly mentioning fakes, fantasies, and forgeries. The difference between a $10 plate and a $100 plate can be the presence of a very small work or mark. Less than reputable people have no problem trying to add marks. There are plenty of junk items on ebay that are pure fantasy. You mostly see them on coffee mugs. It is pretty easy to distinguish between something new and something old. Always work with a dealer who at least has a good reputation. Many experts specialize in china. We love dealing with railroad china! We would be thrilled to learn about your single item or entire collection. Just send us pictures of whatever it is you are looking to sell or have appraised. Please include any relevant markings and list the dimensions. We will respond quickly.